I attended my very first art trading card show last Saturday night (Feb 27) primarily because I was one of the 50 artists at Carded!It started at 8:00PM and we would have been on time if only I remembered to bring the exact address. By the time we actually found the place, it was close to 8:30PM and the place was packed! I introduced myself to the curators and as they thanked me for submitting they also gave me a stack of my very own trading card. It did not long before someone asked if I have something to trade. Before I long I was trading cards and ended up having 18 different cards from traders and artists! It was a lot of fun. It was also fun to have “fans” request for me to sign my card and talk a little bit about my art. I would have stayed a little longer if I was not feeling unwell due to my allergies and having a cold AND also the fact that my dear husband and (by then sleeping) daughter were waiting in the car for me. Although my husband was not a big fan of the event, he is my greatest fan and supporter, and he came along “just in case I did not have anybody to talk to at the show”. It was also very nice to have a ride home instead of taking transit. It is always inspiring to meet other artists and their art. I’m looking forward to attending this fantastic event next year and perhaps even submit for their other show, Hot One Inch Action, where they trade buttons instead of art cards. These are great events for artists and art collectors alike or even just for a social event and meet other people who enjoy art. There were even a few kids present and trading cards already! 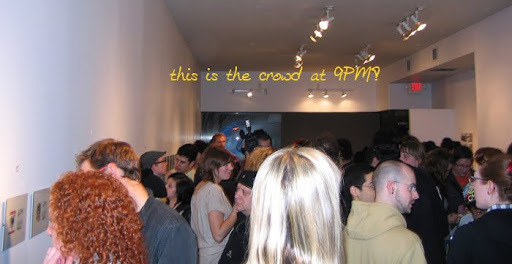 Here’s a pic of the packed gallery at around 9PM. Pardon the angle on the picture since I did my best to get the camera as high as possible. 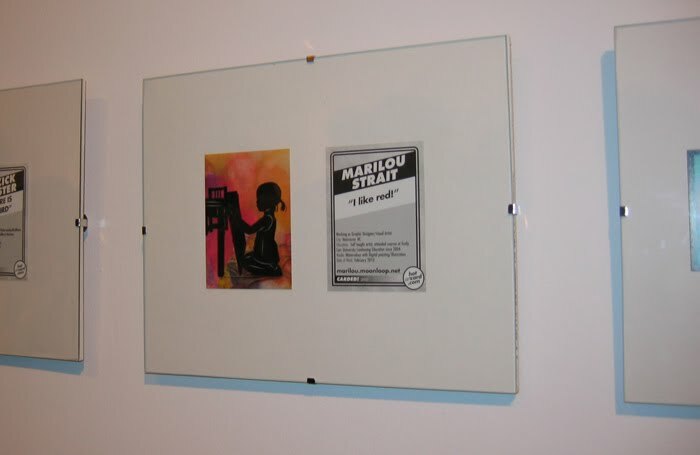 Here’s a pic of the piece I submitted hanging on the wall. You can also look at my other silhouette art on my web page. Please feel free to leave a comment if you are so inclined. Check out the Carded! website for all the 50 art trading card entries. As mentioned in my previous post, I am on this show from February 5 to Mach 20, 2010. 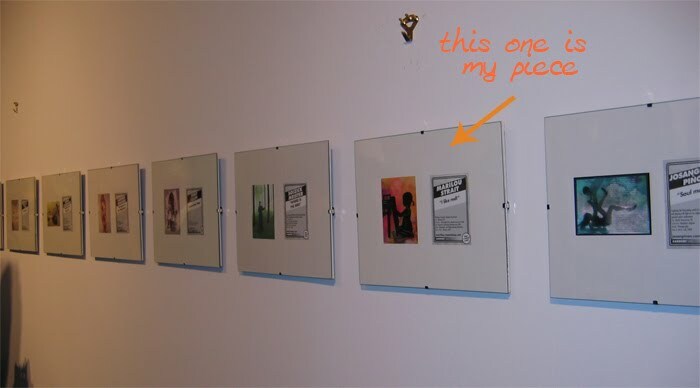 Here are six of my artwork installed at this show. NB: I sold the “Swinging Fall” on the last day! The holidays has also given me some inspiration to create a series of watercolour paintings from our travel pictures taken in Utopia, TX. In January I started one preliminary painting and had time for some experiments since it has been a few months since I painted with watercolour (I have been doing mostly acrylic since July 2009). I will post some of those sketch book painting in my future posts. I finally bought a set of artists quality watercolour paints with 20 colours recently and I was just amazed how much better the colours were. 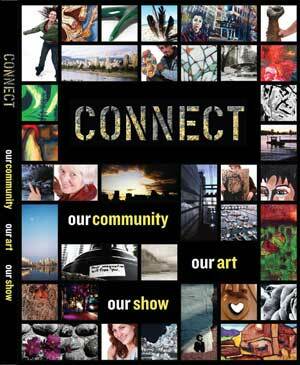 The opening night on February 5, for the Connect Community Art Show in Vancouver was fabulous with record number of people attending. The most exciting part for me was to see guests and art lovers reaction to my paintings and getting direct valuable feedback from them. Needless to say, I was really inspired! The organizers also produced a catalogue with a picture of the artist and one piece of artwork, I’m on page 29! The catalogues are on sale for $20 at the show. Jacana Gallery, 2435 Granville Street, Vancouver. I finally completed 3 silhouette art pieces. 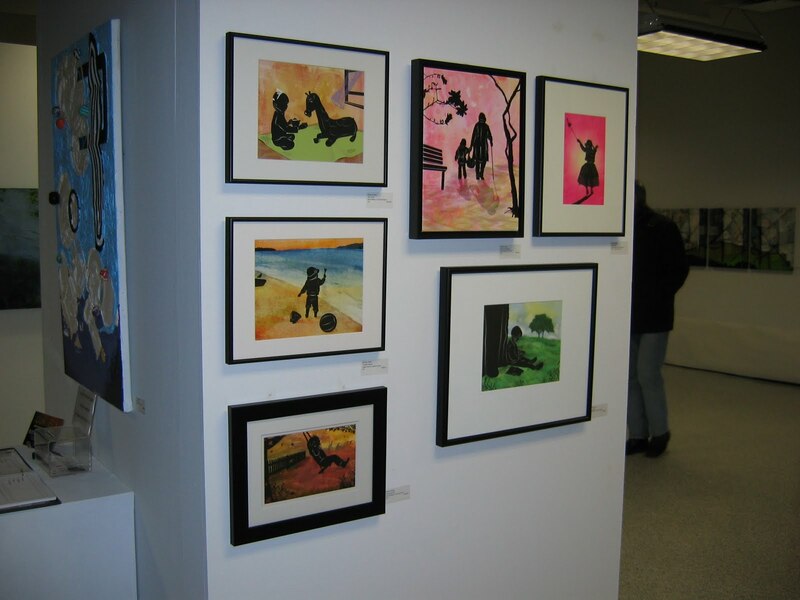 Two of those paintings were submitted for a show and was pleased that one of them was accepted to”Carded! Trading Card Art Show”. You can read more about Carded! and if you are in the area, drop by. Mention that you saw my blog and I’ll give the first 5 people one of my own trading card.